Messages of support for Christchurch are flooding in. 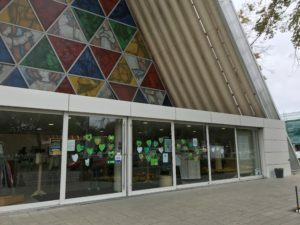 Across the globe people have reacted to Friday’s events (15 March 2019) where 50 people were gunned down while attending prayers at two mosques here in Christchurch. Support, solidarity and a call for love and peace to replace anger and hate are the core of the messages we have received. Below are the people and organisations we have heard from and some also have links to their messages. Read them and know that we are supported in their prayers and that we are not alone in our grief and loss. Bishop Peter has received many more personal messages assuring of prayers for him as he leads the Diocese at this time. Those sending such messages include Bishop Victoria Matthews (previous Bishop of Christchurch), Bishop Helen-Ann Hartley (Bishop of Ripon in the Diocese of Leeds and formerly Bishop of Waikato and Taranaki), and Bishop Henry Bull (one of the bishops in the Diocese of Polynesia). 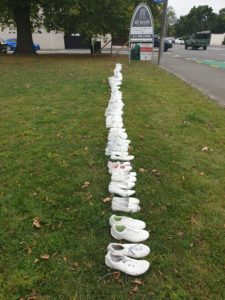 50 pairs of shoes representing the lives that were lost on Fri 15 March, outside All Souls Church, Merivale. A spontaneous video message from Year 10 students from Macarthur Anglican School in New South Wales.